I think the first cheek I ever ate was a fish cheek. Who knew that there would be so much tasty meat hiding in the head? Flash forward, to when I bought two baby pig head's for a song. I was dismayed at how little meat they had on them. The cheeks, however, were richly fatty and possibly the sweetest meat I've tasted. In Logrono, a region of northern Spain, I had a plate of delicious stewed beef cheeks, but my mouth tasted so much of cured ham and arbequina olives, it was hard to appreciate. And on it went...until I had beef cheeks smothered in stinky cheese. It was braised beef cheeks covered in Chimay Classique. Although their beers are more well-known, the Chimay Trappist monks also make a great range of Belgian cheeses. All of their cheeses are the same basic Passendale-esque recipe, washed in beer, but aged for different periods of time. The gooey, stinky little slivers melting into my demi-glace was from a very young variety. What was revelatory about that moment was just how perfectly the flavor of the lowly beef cheeks paired with a classy little cheese I had thought too expensive to be anything but a table cheese. And the moment passed. But it stuck with me, waiting for a moment to revive itself into the forefront of my consciousness. Then I saw them - my lovely cheeks. Cryovac'd in a sturdy little plastic bag, waiting for me in the butcher's meat case. What to do with them, was the obvious question. In a passing thought, I wondered if I could serve them rare, like a steak. Cheek Steak. 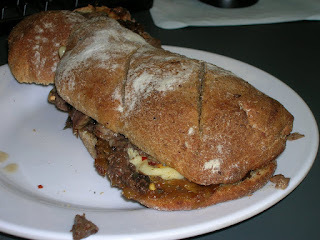 Philly Cheek Steak! I took the idea and ran. To construct a proper steak sandwich, I needed the right bread. 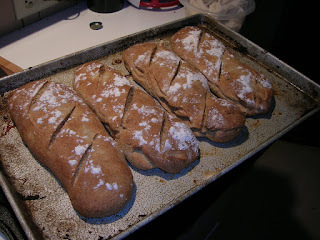 I made a full-bodied loaf (or mini-loaves) of rye bread, sweetened with roasted garlic pureed into the dough. To put the "cheese" back in "cheek steak," I had hoped to buy the Chimay Classique I loved so much before. It was sadly out of stock, but settled on the slightly stinkier, slightly saltier Taleggio. 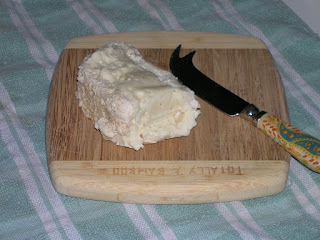 An Italian washed-rind cheese, Taleggio is washed with a salt-water brine, not beer. This gives it a thinner skin than the Chimay cheeses, but a much runnier consistency. 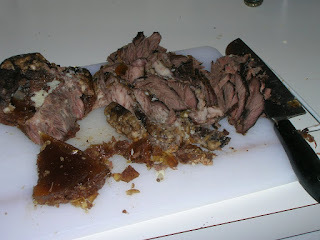 The cheeks were comparatively easy; I tossed them in a low oven with a diced onion, a can of beef broth, and a bottle of malty, Belgian-style ale (but without the imported price tag). They slowly broke down into a tender mass over 3 1/2 hours. Lastly, I needed a topping. 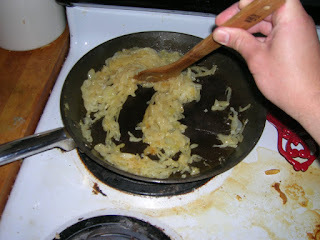 To replace the traditional sauteed onions and peppers, I smeared on a layer of caramelized onions spiked with a few sprigs of thyme. And voila! The unctuous flavor of the beef cheeks, still rich in mouth-sticking gelatin, slightly tempered with the sweetness of the onions, spiked with a tang of zesty, funky cheese, all packaged up in a dense, chewy loaf of rye goodness.